March is well underway, and that has me eager to decorate the outside of my home for Spring. Today, I am going to show you my front porch adorned for the upcoming season. This year, on my front door, I decided to do something unique. Instead of making a swag that hung overhead, I decided to make a corner swag. Tomorrow, I will show you how easy it is to make your own corner swag. Instead of a traditional wreath, I hung a vintage looking mail box and embellished it with a birds nest, flowers, and ribbons. Admiring all of the beautiful porch topiaries in those seasonal home decor catalogs and not wanting to pay their big price tag, I decided to make my own for a fraction of the cost. I had some inexpensive ivy topiaries and simply hot glued Spring flowers to the ivy. Completing the designer look, I simply added bows that tied back to the swag and mail box. I placed the topiaries in my antique urns and placed Spanish moss around the base. This bunny has graced my porch for the past few years. I simply gave him an updated look with a new bow. Tomorrow, I will show you how to make the corner swag. I promise it is super easy. Thanks so much for visiting today! I hope that you have a wonderful day!!! Shannon, your porch is Spring perfect and so inviting. The swag is stunning and I will be looking forward to the how-to’s tomorrow. The mail box for the door is a creative idea and I love how it looks with the swag! Happy Monday! Thank you, sweet friend! I hope that you have a beautiful day! Happy Monday!!! So beautiful Shannon!…Love the topiaries and that gorgeous corner swag!…How so very creative! Thank you, sweet friend! I hope that you enjoy your day! Happy Monday!!! Beautiful, springy welcome to your home! I love that swag! Thank you, Zenda! I hope that you enjoy your day!!! Just lovely; I also have a vintage looking mailbox that I’d like to hang on my door but am unsure how to do so. Can you please let me know what hardware was used. Thank you so much! Hi Cindy! Thank you for your sweet comment. My mailbox has a little hole at the top. I used a Command Strip to hang it. The hole slipped right on the Command Strip hook. I hope this helps. Thank you, Cheri! I am so happy that you stopped by! I hope that you have a wonderful week!!! Love love love the corner swag Shannon! And the beribboned bunny and topiaries, mailbox and nest! I can’t wait to take my shamrock down next week and change my entry after seeing your beautiful creativity! Thank you, Jenna! I hope that you have a wonderful week, sweet friend!!! How adorable and lovely. It seems to say Happy Easter to all and all are welcome! Thank you, Marilyn, for the very sweet comment! That is just how I want my guests to feel. I am so happy that you stopped by for a visit. I hope that you have a beautiful week!!! What a precious and pretty Easter entrance to your lovely home! Preparing and decorating for Easter is one of my most joyful seasonal opportunities. Everything is so light and airy and optimistically anticipating the moments of rebirth for us all! Thank you, sweet friend, for the very kind comment! I love this time of year too! I hope you are enjoying your week!!! Just beautiful! Want to come style my front door? Thank you, sweet friend! I hope that you are enjoying your week!!! Extremely pretty—somehow, I don’t think shaking snow off your pretty designs would be much fun. I’ve had to rescue my spring wreath from blowing off the door, twice now. Thank you, Sandi! Hopefully, Spring will head your way soon! It has been unseasonably warm here this year which gives me Spring Fever. I’m so happy that you stopped by, and I hope that you are enjoying your week! You are so creative and I think a corner swag is so unique. I pulled my spring wreath out of storage a few weeks ago and it’s still sitting on a work bench. Shame on me I know! You’ve inspired me to get busy and hopefully I can find a cute bunny like yours also. Thank you for sharing with us this week at Celebrate Your Story, have a great week. Thank you, Sandra! I hope that you are enjoying your week!!! Thank you, Kim, for the sweet comment! I hope that you are enjoying your week!!! Thank you, Sarah! I hope that you are enjoying your week. A wonderful spring welcome! the corner swag is a fun change and I especially love the mailbox on your door! Thanks for sharing with SYC. Thank you, Jann! I hope that you are having a wonderful week!!! Hi Shannon, just hopping by to let you know that you will be featured at SYC this week. Thank you, Jann! I am so flattered. You have made my day! I hope that you are enjoying your week!!! The bunny is just precious. The swag is remarkable. Gorgeous. Thanks for linking to Monday Social. Gorgeous, Shannon! What a great job you did. And thanks for providing the tutorial for the swag. You’ve made your space so welcoming for springtime! 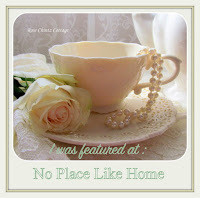 Thank you for joining the Grace at Home party at Imparting Grace. I’m featuring you this week! This is so adorable. I saw that same rabbit at Marshall’s and thought of getting it. I wish now I did. Thank you for sharing at Dishing it and DIgging it link party. Beautiful and I adore your bunny!